I'm not much of a soda drinker, but I cannot pass up the occasional root beer with pizza, and I always order a cherry cola when I go to the movies. In fact, I've never had a cherry cola outside of a movie theater! Isn't that funny? The flavor is definitely special to me and only reserved for that single activity. 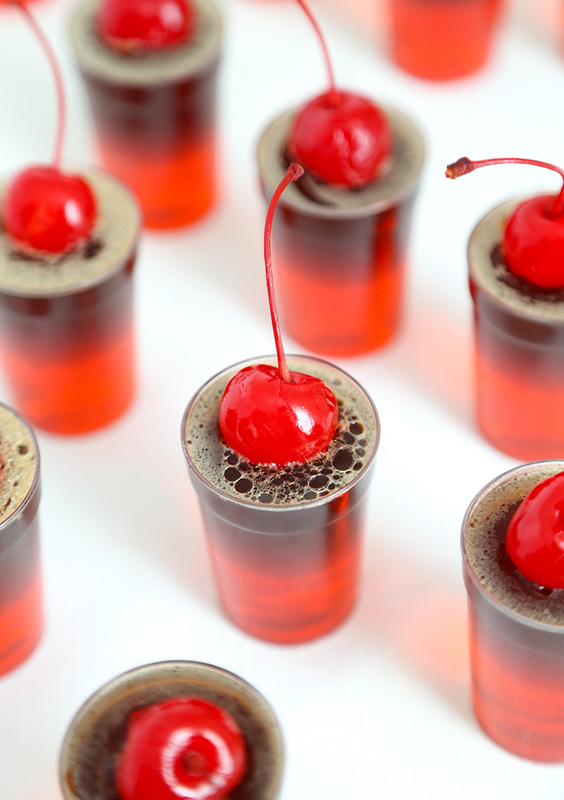 I recently decided to rethink my decorum because I don't get to the movie theater very often, and with Memorial Day coming up, I couldn't think of something more fun to serve than cherry cola jello shots! I started craving buttery popcorn as soon as I tasted one of these potent little cups. Flavor memories are like that. They transport you to another time and place! I think these would be great for barbecues or packed in a cooler for lakeside enjoyment. Something about them just screams summer - and fun! For me they are pure nostalgia. I hope you enjoy! 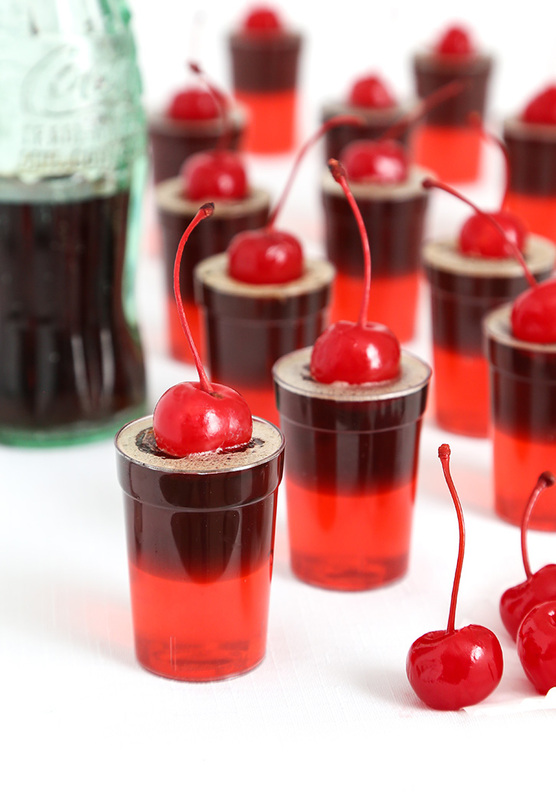 If you’d like to omit the alcohol in this recipe for a purely jellified dessert, then I recommend replacing the cola and cherry liqueur with 2 cups of Cherry Coke in the cola layer. Replace the rum in the maraschino layer with 1/2 cup additional maraschino cherry juice. Place 16-18 two ounce shot glasses on a large baking sheet. 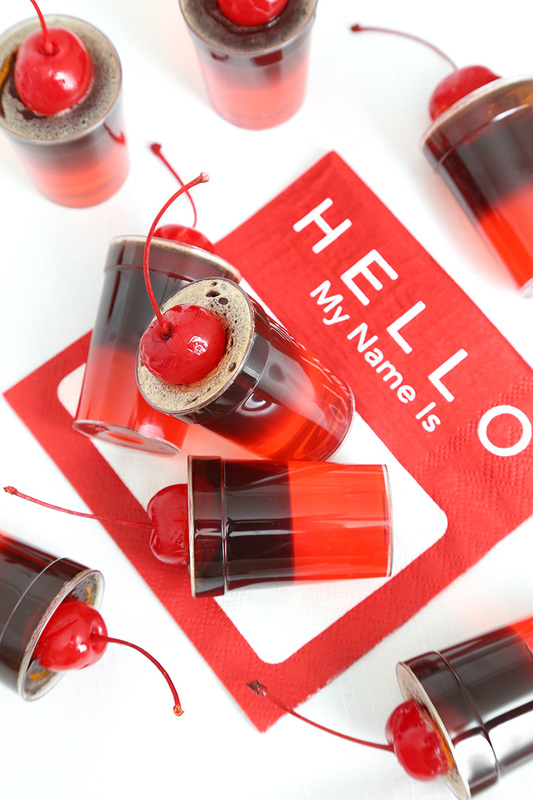 Make the maraschino layer: Combine the cherry juice and rum in a 2 cup measure (or larger) with a pour spout. Pour the cold water into a small microwave-safe condiment cup. Quickly stir in gelatin. Let stand until absorbed, about 2 minutes. Microwave the cup for 10 seconds, or until the gelatin is liquid. Pour the gelatin into the cherry mixture. Stir until combined and immediately divide between the shot glasses, pouring the cherry mixture about halfway up in each glass. Chill until set, about 1 hour, or speed setting in the freezer, about 15-20 minutes. 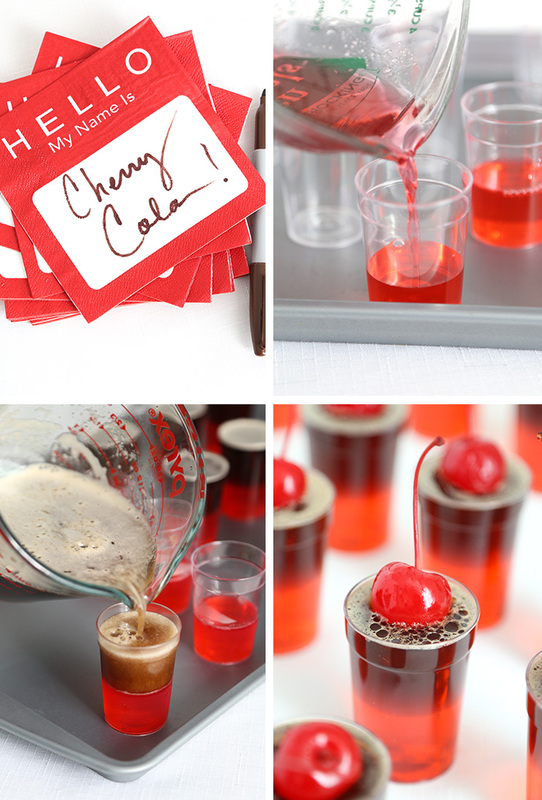 Make the cherry cola layer: Combine the Coca-Cola and cherry liqueur in a 3 cup measure (or larger) with a pour spout. Pour the cold water into a small microwave-safe condiment cup. Quickly stir in gelatin. Let stand until absorbed, about 2 minutes. Microwave the cup for 10 seconds, or until the gelatin is liquid. Pour the gelatin into the Coca-Cola mixture (this will cause the cola to foam). Stir briefly and immediately divide between shot glasses, filling the glasses to the top. Chill until semi-soft, about 5-10 minutes in the refrigerator. Press cherries into the semi-soft cola layer. Chill until firm, about 1 hour. Store the shots in the refrigerator until ready to serve. Serve with long toothpicks for easy removal of gelatin from the cups. Where did you find the cute glasses you masithem in? I picked them up locally, but if you follow the link below you'll find glasses that are almost identical to the ones I used in this post. Yum! What a fun party idea! These jello shots look so delicious and perfect for parties! What kind of cherry brandy did you use? Hi Sam! Hiram Walker, if I remember correctly. It is not top shelf booze but it worked well in this recipe.